Can you slice a watermelon with a katana blade? Do you uses nunchucks to pound out pizza dough? Can you catch a fly with chopsticks? Then you are a kitchen ninja. Clearly your rigorous training has paid off because your culinary concoctions are deadly delicious. You make the knuckleheads competing on Top Chef look like low-level samurai sous chefs. 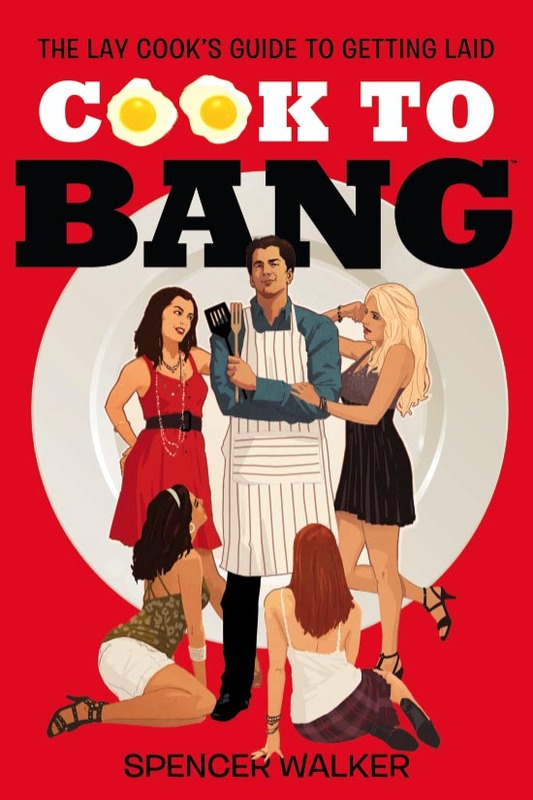 Now it’s time to drop a sake bomb in your home kitchen in the ultimate mission: sexual culinary conquest. There’s an unattainable geisha whose lotus flower has not been plucked in many rice harvests. It’s time to mix your Japanese fighting style with some Western flavor to make funky fusion food. Assemble your fiercest weapon: APHRODISIACS and make your sensei proud. Should you fail, you must perform hari-kari. Now go get ‘em, you nasty ninjas! 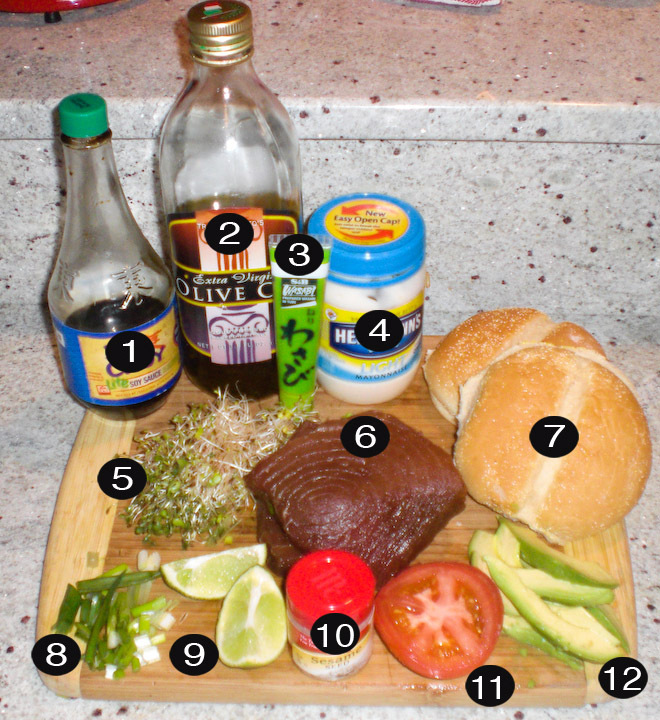 Create the tuna marinade by mixing together the green onions, lime juice and soy sauce in a bowl. Place the tuna steaks in the bowl, flipping once so the entire tuna can soak up the marinade and allow the flavor to set (approx 15 minutes). 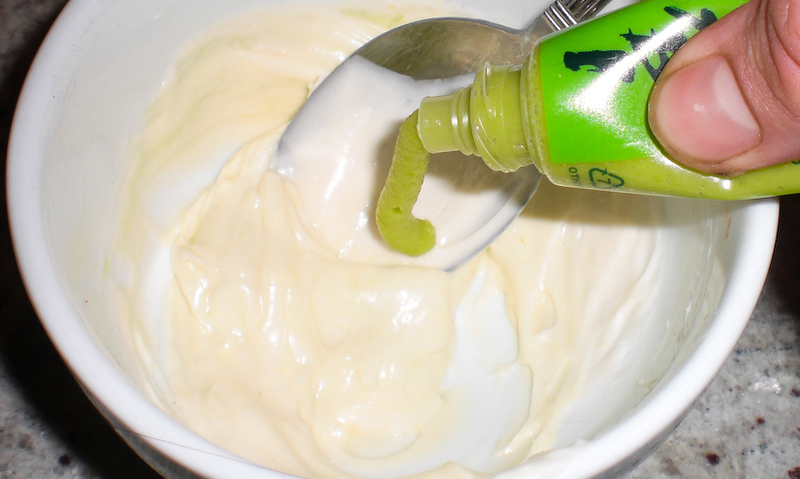 Create wasabi mayonnaise by mixing the wasabi and mayonnaise together in a bowl. You can also buy it pre-made, but where is the fun in that? Heat the olive oil in a pan on high heat. 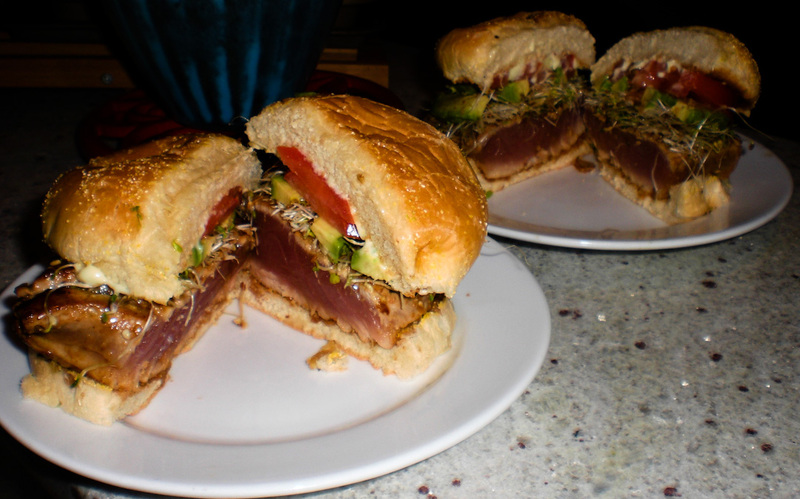 Sprinkle sesame seeds on the top half of the tuna steaks before placing that side down on the pan. Sprinkle sesame seeds on the other half of the tuna while the bottom sears, then flip it and sear the other half (approx 1 minute on each side). Don’t waste a perfectly good (and pricey) piece of fish by overcooking it. You might as well buy a can of tuna. Toast the hamburger buns then spread a thin layer of your homemade wasabi mayonnaise on the top half. 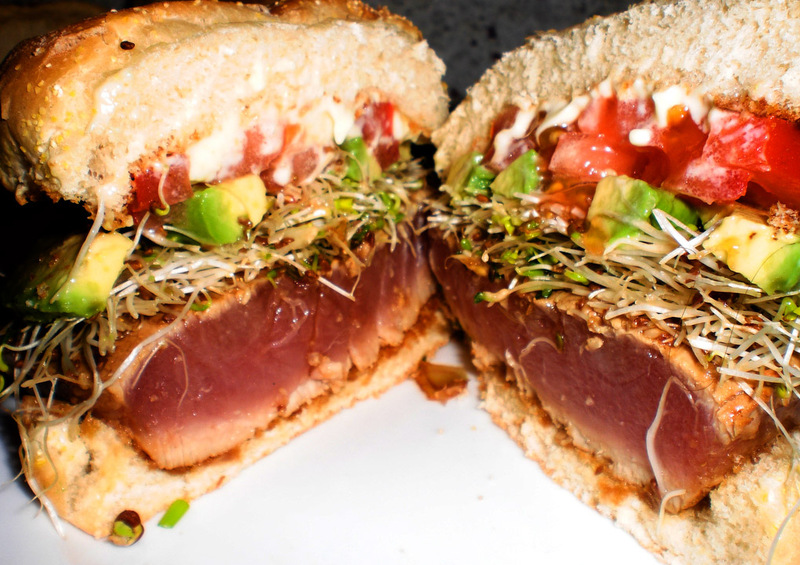 Now assemble the tomato, avocado, sprouts and seared tuna steaks and close up shop on the buns. Cut the sandwich in half and serve.